Click here to watch Avril perform "What The Hell", "Girlfriend", "I'm With You" and an interview (with "Smile" and "Wish You Were Here") at the Walmart Soundcheck. This was posted on Avril's official VEVO. It's a track by track commentary of each album track (that ends at Darlin'). It's a great watch, but it features clips from each song (and some very pretty pictures), so if you want to be surprised, I suggest waiting. This acoustic performance of What The Hell on T4 is a must watch! Great vocals! Avril and entourage have arrived in Tokyo for another piece of the "Goodbye Lullaby" promo tour. After Japan, it's to New York City and Canada! Thanks Avrilsmusic. Amazon.com has posted an almost 4 minute preview of the Making of Goodbye Lullaby, featured on the deluxe edition of the album. 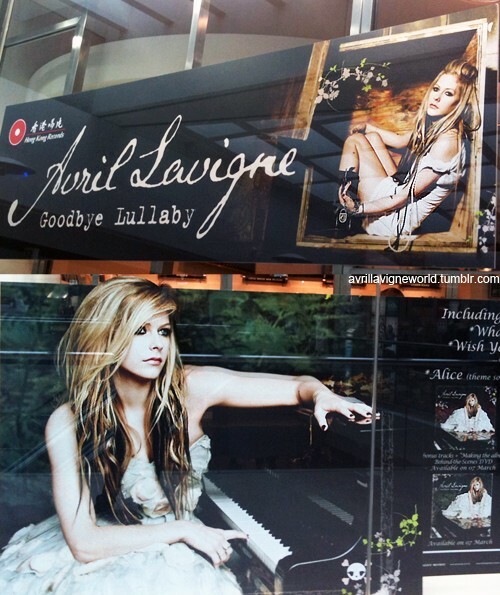 "Goodbye Lullaby" has (unfortunately) leaked. You can find it quite easily by searching the Internet, but please DO NOT post links to downloads, or streaming. If we want Avril to continue making amazing music for us to all enjoy, we must remember to support her by purchasing her music (iTunes, physical CD, legal mp3 downloads, etc). I have listened to these leaks and am beyond blown away. It is everything we could have wanted from her. Great job Av, and I can't wait to purchase the official CD when it hits stores in less than 2 weeks! For those of you who are waiting to listen, I have soooo much respect because it is hard to resist temptation! BTW, Smile, Wish You Were Here, I Love You, Everybody Hurts, 4 Real and Remember When are the stand out tracks for me. Hearing the full songs changed my opinions from the previews. They are all breath-taking. A familiar wailing on a certain Loud album track last autumn got us to thinking, 'What the hell has happened to Avril Lavigne?' Four years on from The Best Damn Thing, the pop-punk princess is back with a new, years-in-the-making record. And here's the kicker: it's mellow. What's with the new direction? Has she packed up the skateboard for good? We hooked up with Av-Lav to find out more. How did you enjoy the Brits last week? "It was cool. It's a very exciting awards show. Because there were so many fans there, it felt like a concert. So many award shows can be boring and serious, but this one was fun." Who did you hang out with? "I kinda just went, did my part and then left. No partying! No nothing for me!" You're coming back with a new album after four years. Have you been nervous? "Everyone's been asking that, but no. I think I'm more relaxed than anything because I've made a record I'm really proud of. I'm really excited and super mellow."